Articles > What Criminal Charges is Conor McGregor Facing? Thursday, April 6, 2018 started off like most days. I arrived at my office, went to court, and spoke with clients. It was basically your typical day in the life of a Criminal Defense Attorney. Sometime after lunch, I started receiving texts and calls asking, “why I flew off the handle” and “to get my act together.” After asking my friends what they were talking about, one of them told me to turn the television to ESPN. As I turned on the television and didn’t change the channel (since I am addicted to ESPN) I saw what all the fuss was about; my doppelgänger, Conor McGregor went off the deep end and caused a melee at the Barclay’s Arena in Brooklyn, New York. 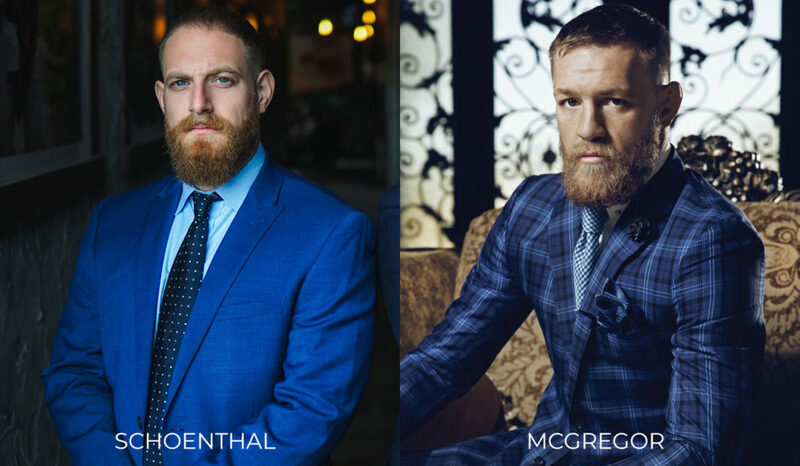 (that was my shameless plug calling myself a Conor McGregor look-a-like solely because of my low-cut hair and aspiringly cool ginger beard). It seems Conor, who is most notable for fighting Floyd Mayweather Jr., (and all the antics that led up to the bout) was upset with his employer, the Ultimate Fighting Championship (“UFC”) for taking away his title due to his two (2) year hiatus from the sport. McGregor showed up unannounced to a press conference at the Barclays Arena and caused property damage when among other things, he picked up a barricade and threw it through a bus window. When the barricade broke the window, some of the passengers on the bus were injured. One of the passengers and fellow fighters, Ray Borg, allegedly had his cornea scratched by glass particles from the broken window. Along with people making jokes about my looks (which happens from time-to-time), I also received many questions about the incident from a criminal defense lawyer’s point-of-view. Many people wanted to know what McGregor was being charged with in criminal court, how the law would treat him if he were in Florida, how much jail time he was facing, and was this even real (I have no idea whether this was real or not, but it was the same week as WrestleMania…just saying). Based on those questions, and the numerous amounts of times I was asked them, I decided it was best if I explained the situation and what was actually going on. On April 7, 2018, the day after the incident, Conor McGregor turned himself into authorities after a warrant was issued for his arrest. After a warrant is effectuated, law enforcement has the ability to arrest and “book” an individual immediately. Once the warrant became apparent, it looks like McGregor turned himself in which seemed like the prudent choice. Upon turning himself in, he was “booked” by local police and formally placed under arrest. According to reports, McGregor was charged with three (3) counts of misdemeanor assault and one count of felony criminal mischief. Conor then went in front of a Judge where his charges were formally read to him in open court and he was released on a $50,000 bond. He was also given another court date on June 14, 2018. Often, when one is arrested, and that person lives outside of the country, that person is deemed a “flight risk.” That means the government is afraid that an individual will or potentially could flee the country and never return to face their charges in court. When this happens, the court can require you to forfeit your passport. Forfeiting your passport restricts your ability to leave the country and return home. Here, the Judge did not deem McGregor a flight risk and did not require that he turn in his passport. McGregor is free to leave the country so long as he returns for his June 14th court date and does not commit any further crimes. As is the norm in cases where there are victims, McGregor also received a “stay away order” from fighters Michael Chiesa, Ray Borg, and a few others. This means that if McGregor has any “contact” with these individuals, the court can find he violated his bond and therefore hold him in custody until his case is finalized. Furthermore, if McGregor is deemed to have violated the stay away order(s), he could also be facing additional criminal charges. Could McGregor Go to Jail? A person is guilty of criminal mischief in the second degree when with intent to damage property of another, and having no right to do so nor any reasonable ground to believe that he has such right, he damages property of another person in an amount exceeding one thousand five hundred dollars. Criminal mischief in the second degree is a class D felony. Since McGregor is facing one count of a class D felony, he is looking at a maximum penalty of five (5) years in prison for this specific charge. It must be noted that it is extremely unlikely that he actually goes to prison for this crime based on his prior criminal history and circumstances surrounding his actions. However, it should still be noted that he is facing five (5) years in prison along with other possible outcomes such as probation and/or house arrest. The biggest and most realistic issue facing McGregor is whether he will become a convicted felon. Becoming a convicted felon can lead to the loss of individual rights and could also restricts one’s ability to obtain government housing, government benefits, and the ability to gain lawful employment. I do not believe McGregor has much worry pertaining to the aforementioned restrictions, but he could be worried about losing certain rights such as the ability to carry and own a firearm (depending on where you are within the United States of America) and the ability to vote and remain in the United States. Again, I am not sure these possible consequences worry or bother McGregor. However, there clearly are immigration consequences and issues at stake. The biggest issue McGregor may want to avoid with becoming a convicted felon is the stigma of actually becoming one. All in all, being charged with a felony carries serious consequences that can affect one’s social status as well as their freedom. A person is guilty of assault in the third degree when he/she recklessly causes physical injury to another person. Assault in the third degree is a class A misdemeanor. Under New York law, one faces a maximum sentence of up to one (1) year in jail if convicted. Therefore, if McGregor is convicted of three (3) class A misdemeanors, he is facing a maximum of up to three (3) years in jail. Again, it is highly unlikely he would serve actual prison time based on the crime, circumstances, and past criminal conduct (or lack thereof) up until this point in his life. However, it must still be noted that it is a possibility. Above forecasts the potential punishment McGregor could face if he were convicted for one (1) class D felony and three (3) class A misdemeanors in New York. At the maximum, he could actually serve, if convicted, 8 years in jail/prison. However, and although I practice criminal law in Florida and not New York, I think it is safe to assume he would not be punished to the max and I doubt he would serve prison time for this case. That is just one lawyer’s opinion. This is also just the beginning of the case. Criminal cases are fluid and ever changing. Charges could be dropped, more charges could be filed, charges could be amended, and so on. It is important to note that my opinions are based solely on the information that has been released up until the point when this article was published. Could This Case Be Worse if it Were in Florida? For the most part, a lot of crimes are uniform across the country with a deviation here and there. Certain states refer to things differently than other which makes the terminology tricky. For example, in Florida we would not call hurting another an “assault.” We would call an unwanted touch a “battery.” Assault, in its basic form, is a threat, the physical aspect of it, i.e. touch, makes it a battery. In New York, an unwanted touch is an assault. Crimes are treated the same where a class A misdemeanor carries a one-year maximum jail sentence just like a first-degree misdemeanor in Florida. So far, everything plays out the same for Mr. McGregor. (2) Whoever commits aggravated battery shall be guilty of a felony of the second degree. Under this statute, McGregor, could potentially be charged with aggravated battery involving a deadly weapon. Under this statute, a deadly weapon is considered such if it is used or threatened to be used in a way likely to produce death or great bodily harm. It would not be a stretch for the government to contend that when McGregor picked up the barricade and tossed it through a glass window that he either intended for the barricade to create great bodily harm which would therefore make it a deadly weapon. In fact, the barricade upon breaking the glass window, cut another fighter’s eye when the glass shattered and scratched Ray Borg’s cornea. Therefore, this could easily be charged as a second-degree felony. If McGregor were charged with an aggravated battery involving a deadly weapon, he would be facing a maximum penalty of 15 years in prison. Therefore, this case could be significantly worse for the MMA fighter had it happened in Florida. It is unclear what will happen to McGregor when it’s all said and done. However, what probably started off as a publicity stunt has clearly taken a turn for the worse and could have potential life altering ramifications for McGregor. At the end of the day, it is important to know the law and what the ramifications are for your actions because you never know what mess one could end up in.